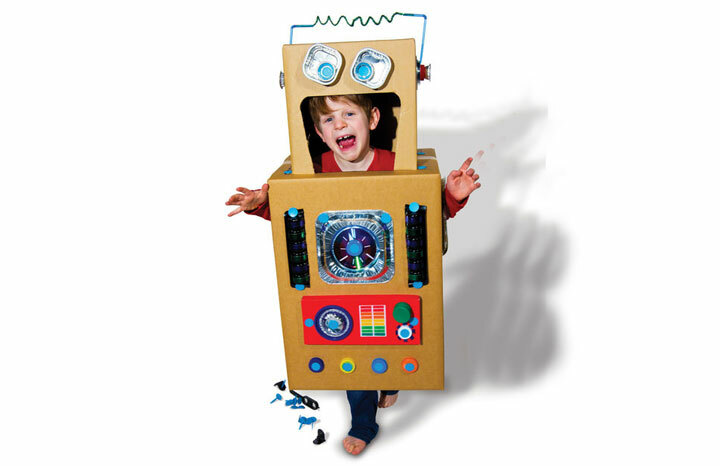 This futuristic costume makes a great Hallowe'en or children's party costume idea for your grandchildren. Made from recyclable materials, it works best when accompanied by some fun robot noises. Beep-boop whrrrrr-Fwap! To make the head of your Robot Costume, use a safe-saw or good scissors and cut out a large rectangular shape from the front of the box. This will be the mouth for your Robot and will frame your head. Add features using foil trays, bottle caps and straws for its eyes and antenna. Connect the features to the box by punching through holes with a safe-saw or scissors and attach using plastic clips or strong sellotape. Your largest box will become the body of the Robot. Use the safe-saw or scissors and cut a circle on both sides of the box for your arms to fit through. Accessorize by connecting foil trays around the edge of the arm-hole using plastic clips or sellotape. Now for the fun part. Gather materials such as shoe boxes, plastic trays, bottle caps, CDs and foil trays to accessorize the body panel of your Robot. Position them on the body to your liking. Connect the accessories using platic clips or sellotape. Then place the head on the top of the body and use the safe-saw or scissors to cut a hole in the top of the body box, the same size as the head box. Connect the two boxes together. Finally to complete the look of your Robot, draw on grills and temperature meters on the body. Top tip: For more character you can wear foil cuffs on your wrists or create carboard knee pads and boots to match your costume. From Makedo and OVO Energy. Makedo offer a range of clips, hinges and safe-saws that work great with this craft idea.